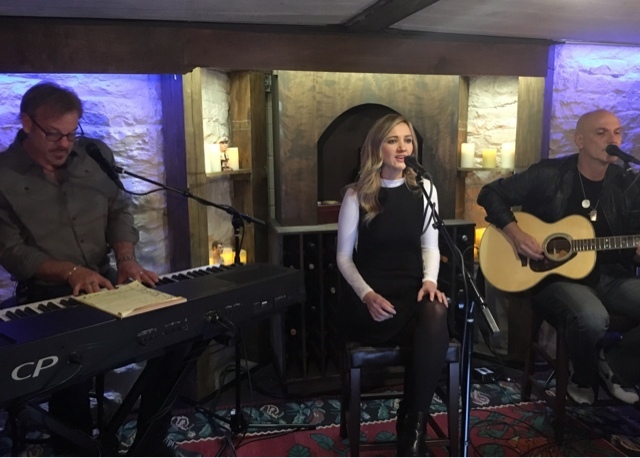 NASHVILLE, Tenn. (December 16, 2015) – Award-winning singer/songwriter Phil Vassar is opening the doors to his personal cellar to showcase wine and spirits, share unforgettable stories and collaborate with special guests, including Sarah Darling and Steve Cropper, in his new video series, “Songs from the Cellar,” which will feature intimate interviews and comedic banter unlike any other show on air or online. Episodes will feature live performances and conversations when it debuts in December 22 onPhilVassar.com as well asSongsFromTheCellar.com. Songstress Sarah Darling and iconic songwriter/guitarist Steve Cropper, known for co-penning “(Sittin’ On) The Dock of the Bay,” join Vassar in upcoming episodes. “This is a first for us, and it’ll be a real treat for our fans. We always wanted to bring them into our home and witness some of the magic that can happen when we play with icons like Steve Cropper and newcomers who are as talented as Sarah Darling. And we found “Songs from the Cellar” was the perfect opportunity to sip some vino, sing our hearts out and share some laughs,” Vassar said. Future episodes will incorporate artists, songwriters and wine connoisseurs as featured “Songs from the Cellar” guests. Each episode will bring of wine, food pairings, world travel and more to the table. The show is not complete without the pairing of storytelling as well as wine and food pairings. Wine, beer, bourbons and other cocktail favorites, all reasonably priced, attractive, crafted and inspired by artists, be featured during each show with a purpose and story. Fans will also be encouraged to submit their favorite wines, spirits and craft beverages. They’ll also be encouraged to submit their favorite watering hole where they want to see Vassar to perform. Vassar continues his #noPHILter tour including a sold-out show at Franklin Theatre Dec. 18 in Franklin, Tenn., which will also be LIVE streamed through Digital Rodeo TV’s free app. Utilizing his strong social following that spans 45 countries and across 6 continents, Vassar’s energetic show is fan driven by social media requests and includes personal interactions with the crowd. Vassar’s most recent live streaming broadcast garnered 309,000 viewers with less than 24 hours notice. “This is all about transcending the venue and bringing our show straight to fans. Although we play more than 135 shows a year, we aren’t able to reach all our fans, and many aren’t able to experience our Christmas shows. Live streaming allows us reach them wherever they are - as well as experience our favorite holiday songs,” Vassar said. Fans can expect to hear original and Christmas classics, new material from his forthcoming album as well as well as his reign of hits, including "Carlene," "Just Another Day in Paradise," "Six-Pack Summer," "That's When I Love You" and many more. Vassar will also be joined by rising singer/songwriter Sarah Darling during the Dec. 18 show. As with all #noPHILter concerts, Vassar will tap into the crowd for social media requests during the show. Dec. 18 - Franklin Theatre - Franklin, Tenn.
Dec. 19 - Opry at Ryman Auditorium - Nashville, Tenn.
Jan. 22 - 8 Second Saloon - Indianapolis, Ind. Jan. 23 - Shipshewana Event Center - Shipshewana, Ind. Jan. 29 - Joe’s Bar - Chicago, Ill.
Jan. 30 - Boondock’s Club - Springfield, Ill.